MusiCare Online says Goodbye To KAOL After 5 Years! All Tribute CDs & Shirts Being Liquidated At Huge Discounts!!! KAOL says goodbye after 5 years. This June marks the fifth anniversary of the birth of KAOL (KISS Army Online) but also the END of our charity raising Tribute CDs. We began in 1997 with the release of the only fan-based KISS tribute disc to be sold for charity using bands from all over the Internet. We've produced a new tribute every year since then and have raised $18,000 for both the Children's Hospital and the Alzheimer's Association. Our non-profit record label, MusiCare Online, which sponsored the KISS Army Tributes is now moving headquarters and moving on to new musical productions and projects that are non-KISS related. As a result, we are closing the chapter on KAOL and holding a HUGE SUMMER BLOWOUT of all remaining CDs and clothing in stock. 60% off CDs and T-Shirts plus one tribute disc is being offered for just ONE DOLLAR! The goal is to give one final gift to Alzheimer's from the KISS world and we can do that if many of YOU step forward and take advantage of our website clearance. If you've been waiting all these years to purchase one of the infamous KAOL discs, this is the last chance you may have as they will surely become collector's items. What we have left in stock is the remastered "Creatures of The Net" (featuring Sound Magazine's version of "Shout It Out Loud", mixed by Bob Ezrin) and the price has been slashed from $15 to just $7. We also have the DOUBLE CD SET, "The Spirit of '78" (featuring Sound Magazine's cover of Gene Simmons' "Radioactive") which has both an audio and video disc and is packed with great musical productions of the 1978 solo albums and collectible video footage (including a live video of Sound Magazine performing "Shout It Out Loud" live at the House of Blues in Hollywood). This originally sold for $25 and is now being offered for just $12. Get either one and you can also purchase the seventy minute Tribute Soundtrack to "A World Without Heroes" for just $1. This Soundtrack disc came inside the book we published by Dale Sherman. The book is sold out but we have some overstock on the Soundtrack itself. For more information, visit the KISS Army Online! Sound Magazine's version of Radioactive now available! KAOL 3 - The Spirit of '78 is now on sale! The CD is the third and final installment of the KAOL (KISS Army Online) trilogy of tribute CDs. The Sound Magazine version of Gene Simmons' "Radioactive" is the second track on the album. KAOL 3 comes with a bonus CD-ROM of video performances of many of the KAOL artists, including a Sound Magazine performance of "Shout It Out Loud", the audio version of which first appeared on KAOL 2 - Creatures Of The Net. For more information on the KAOL series and to place your order, visit the KISS Army Online! Shout It Out Loud re-released on updated KAOL 2 - Creatures Of The Net! KAOL 2 - Creatures Of The Net was re-released on August 3. The new version features previously unreleased tracks and some of the returning tracks have been remixed. The CD marks a change in charities for KAOL. This time, all proceeds go to Alzheimer's Association. Sound Magazine's very Partridge rendition of "Shout It Out Loud" is once again highlighted on the album. If you didn't get one of the original pressings, now is your chance to purchase this landmark release. For more information on KAOL 2 - Creatures Of The Net: A New Millennium as well as the rest of the KAOL series, visit the KISS Army Online! Sound Magazine's version of Gene Simmons' "Radioactive" is finally finished. 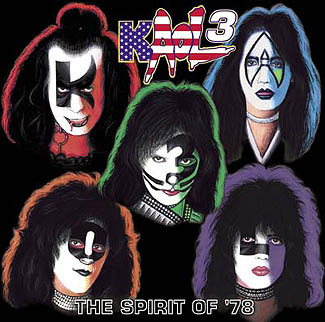 The track will appear on KAOL 3 - The Spirit of '78, the final installment of the KISS tribute CD trilogy from KAOL (Kiss Army On Line). Like its two predecessors, the CD is a charity project with all proceeds going to cancer research at the Children's Hospital of Wisconsin in the name of Eric Carr. Carr, KISS' drummer from 1980 - 1991, died of heart cancer in 1991. The CD has a projected September, 2000 release date. Sound Magazine's previous Partrified KISS cover, "Shout It Out Loud" will resurface on the much-anticipated re-release of KAOL 2 - Creatures of The Net: A New Millennium. The CD is expected to hit the stores later in the year. For more information on the KAOL project, visit the KISS Army Online! Sound Magazine performed at the Riviera Hotel in Las Vegas on Sunday, November 28 as part of Mars Talent Agency's Tribute Showcase. Response was extremely favorable for Sound Magazine, which performed a stellar 20-minute set of Partridge Family favorites, including I Can Feel Your Heartbeat, Doesn't Somebody Want To Be Wanted, I Woke Up In Love This Morning, Summer Days, Lay It On The Line and of course, the Partridge Family anthem, I Think I Love You. tribute bands, you can still enjoy your favorite old groups. Missed seeing The Beatles during your misspent youth? Still cherish the KISS lunchbox you had in grade school or find yourself mesmerized by Partridge Family reruns? If you answered yes to any of these questions, you're not alone. Whether it's nostalgia or simply love of the music, more and more pop-music fans are looking to experience the sights and sounds of yesteryear. Thanks to an amazing musical substitute known as the tribute band, those glory days are here again. More than twenty years after the original - the Broadway show Beatlemania - tribute bands have become a veritable phenomenon, touching virtually every major artist and reaching all corners of the globe. While most people are familiar with the concept of a cover band, which performs songs by other artists, tribute bands take things a step - or perhaps several steps - further by replicating the sound, look, and even the personality of a particular act. More than just a sentimental journey, tribute bands mean big business. Their fans are so faithful that tributes often have longer careers than the artists who inspired them. And, tribute bands can have a major impact on the careers of the original artists. Although they rarely capture the attention of the press and many longtime musicians consider them blasphemous, a devoted audience demands their existence. Of the hundreds of tributes scattered throughout the world, the ones that are most enduringly successful are the ones that do the most accurate re-creations. Take "1964"...The Tribute, who for the last decade and a half have made a living performing 180 to 200 shows a year as a facsimile of The Beatles. "We called The Beatles' original tailor, and he gave us a lot of help with the designs and patterns of our suits," says Mark Benson, 1964's John Lennon. "We all use the same instruments - same year, same model - and the same type of strings they used." The largest obstacle for the band was finding someone who could sing like Paul McCartney and play bass guitar left-handed. They eventually found Gary Grimes, who although not left-handed and not a bass player, "learned to play bass left-handed," says Benson. Likewise, hand dominance was an issue for 1964's drummer. "Ringo (Starr) played right-handed," says Benson. "Our drummer is left-handed, so he had to switch over. For the first six months, we looked great, but nobody was dancing, believe me." Perhaps the greatest challenge for a tribute-band member is approximating the physical appearance of another, usually idiosyncratic, individual. Ron Schneider, of the ZZ Top tribute Eliminator, has spent the better part of his life growing out his beard to match the shocking navel-length growth of his ZZ Top counterpart Dusty Hill. "I haven't shaved in twenty-two years," he says. The furthest any band member has gone to re-create a look is debatable, but one Neil Diamond impersonator is rumored to have had plastic surgery in an effort to more closely resemble Diamond. What happens when a tribute band comes to the attention of the original artist? The reactions range from glowing to litigious. When the British heavy-metal band Judas Priest was in search of a replacement for longtime singer Rob Halford, they plucked his successor, Tim "Ripper" Owens, from an Ohio-based Priest tribute band called British Steel. One KISS tribute, Black Diamond, was even developed with the assistance of singer/guitarist Paul Stanley, who allowed the band to use KISS' original costumes and stage props. Benny Doro, Black Diamond's Paul Stanley, says the success of KISS tribute acts was partly responsible for the band's return to the "glam" look that was their hallmark in the '70's. "I know the tribute bands had a lot to do with KISS' decision to put the makeup back on," says Doro, who explains that KISS took note of the correlation between tribute performances and a surge in sales of makeup-era albums. In another case of art imitating life, KISS tapped the group Hotter Than Hell to double for them in their upcoming movie Detroit Rock City, which will be released by New Line Cinema August 13. By contrast, the reaction of The Beatles' organization to the 1964 group wasn't quite so positive. Apple Corp., which administers The Beatles' copyrights, sued 1964 for trademark infringement. "They spent two and a half years trying to make us cease and desist completely," Benson says. Ultimately, the case was settled, "and as far as I know we're the only group that has federal court documents stating that we have an agreement with Apple Corp. to continue doing what we do," he says. Generally, the original artist is happy to receive the free publicity (not to mention the royalties to which they are entitled). Howard Pattow, founder and leader of the Partridge Family tribute Sound Magazine, says, "When people come to our show and have a warm, fuzzy moment, they run out to the record store and buy a CD." Perhaps equally important, a tribute's performances can introduce a whole new generation of listeners to the stars of days gone by. Such is the case with Super Diamond, who in the course of injecting a rock-and-roll edge to Neil Diamond's shtick, inspired many young fans to investigate his recordings. The ultimate testimony to the excitement and adulation surrounding tribute bands is the loyalty of the fans. "There are tribute groupies, no question about it," says Rich Fox, creator of the Tribute Band Mania! Web site. "For them, going to see a tribute band is almost as exciting as going to see the real band." Doro agrees, claiming that Black Diamond has "tons" of groupies and that "most of the time they don't want you to take the makeup off." So what happens when a tribute band calls it quits? Remarkably, they can do reunion shows, just like the original artists. Fox cites the now-defunct Queen tribute Sheer Heart Attack as an example, noting, "Much like a Who fan waits for the next Who reunion, Sheer Heart Attack fans wait for their next reunion." Bj�rn Volvo-us of the ABBA tribute Bj�rn Again, says that as long as the demand is there, any tribute can continue performing, but adds, "If you are no longer popular, it's time to hang up your platform shoes." with new KISS tribute CD! Sound Magazine: a tribute to The Partridge Family will be contributing another Partrified KISS tune for the upcoming tribute CD entitled "KAOL 3 - The Spirit Of '78". Like its two predecessors, the CD is a charity project, with all proceeds going to the Children's Hospital of Wisconsin in the name of Eric Carr, KISS' drummer from 1980 - 1991. Carr died in 1991 of heart cancer. For more information on the KAOL (Kiss Army On Line) CDs, visit the Musicare Online website. (and why you should consider playing in one). Want to make a musician laugh? Try these words: "tribute band". But don't be so quick to snicker. Sure, low-grade acts have ruined the genre's reputation, but believe it or not, plenty of reputable players are earning a living in tribute bands. In many respects they've got a head start over groups who are agonizing over original material: They play familiar songs, have a ready-made fan base, and appeal to club owners who don't mind when their venue is packed to the rafters. Some hard-working outfits have even earned their own share of fame through paying tribute to someone else. Yet several questions remain. One - "How can anyone stand to play in a group like this?" - you'll have to answer for yourself. The more fundamental issues-namely, defining what exactly a tribute band is and how they earn their living - we can tackle right here. The first factoid to absorb is that tribute bands and cover bands are entirely different animals. "A cover band just plays the songs of other artists, whereas a tribute band actually tries to recreate the persona of a band," explains Howard Pattow, producer and member of the Partridge Family tribute Sound Magazine. "The best example would be Beatlemania, the Broadway show, which was a prototype for what we do. Four guys who looked, dressed, and talked like The Beatles - they gave you the impression of being The Beatles." Creativity, in fact, often separates the great tribute band from the merely good one. Bj�rn Again (ABBA) is undoubtedly the world's most popular tribute. They've released several CD's (including The Greatest Hits of ABBA are Bj�rn Again), played concerts in more than thirty countries, performed in front of festival-sized audiences, and even entertained at the ceremonies where England handed Hong Kong back to China. Similarly, Super Diamond have also added a rock & roll edge to their act, doing amped-up Nineties versions of Neil Diamond classics, which can be heard on Super Diamond: 14 Great Hits. Meanwhile, Sound Magazine's first stab at creativity is their Partrified version of KISS' "Shout It Out Loud", which was mixed by Bob Ezrin for the KISS tribute CD, KAOL 2: Creatures Of The Net. The more successful tribute bands often wind up meeting the artists they're impersonating. Pattow remembers telling David Cassidy about Sound Magazine: "The look on his face was a mixture of, 'Gee, I'm flattered you guys are doing this,' and 'You guys are out of your minds.' I also spoke to Danny Bonaduce. His reaction to Sound Magazine was" - and here he falls into a Bonaduce voice - 'You've got a Partridge Family tribute band?...Why?!. He then asked which character I portrayed. I tried to explain that we were like the Partridge Family grown up - I said, 'We don't have a little red-headed kid playing bass.' And he goes, 'Well, neither did The Partridge Family.'" The irony doesn't escape Pattow, who admits, "We're actually doing a tribute to a band that never existed." So how do you break into this intriguing line of work? It helps to connect with agencies that specialize in tribute bands. A few of the bigger houses are the Booking House (2484 Spruce Needle Dr., Mississauga, Ontario, L5L 1M6 Canada; (905)569-7281; www.bookinghouse.com), Acclaim Entertainment (1190 Metcalfe St., North Bay, Ontario P1B 2R4 Canada, (705)472-0070, www.acclaim-music.com), and AAA Entertainment Consultants (32 Robbins Rd., Springfield, MA 04401; (413)736-3830). If you want to impress these agencies, you need to supply a cassette recording or video and a professional press package, which should include a photo, a bio, a song list, an equipment list, and your logo. If you've already been playing tribute gigs, a concert video, a list of past appearances, references, and sample mailers are also highly recommended. But do not contact an agency until you've polished your act - agents estimate that approximately half the bands that apply get rejected. If you are retained, be ready to work. It's not uncommon for an established band to be listed by different agencies, as each company tends to focus on the region where they are based. Beyond finding gigs, these companies can provide guidance, direction, and some occasional unexpected help. Pattow says that an agent arranging a Sound Magazine job in New York happened to own a replica of the Partridge Family tour bus. "I asked, 'Does that bus run?' He said it did, so I said, 'Then it's clear. We have to make our entrance driving up in the bus.'" Shout It Out Loud with Sound Magazine! Sound Magazine: a tribute to The Partridge Family will be contributing a very Partridge-esque version of the KISS classic "Shout It Out Loud" for an upcoming tribute CD entitled "KAOL II - Creatures Of The Net ". The CD is a charity project, with all proceeds going to the Children's Hospital of Wisconsin in Eric Carr's name. Carr was KISS' drummer from 1980 - 1991. He died in 1991 of heart cancer. Sound Magazine's version of "Shout It Out Loud" stays true to the Partridge Family sound and is sure to amuse and entertain anyone familiar with the original. In fact, the co-writer and producer of the original "Shout It", Bob Ezrin, personally mixed Sound Magazine's track for this CD. To find out more about KAOL (Kiss Army On Line) or to order the CD, visit the KISS Army Online! Tribute bands are very popular right now in local rock clubs. But Sound Magazine, a tribute to the music of The Partridge Family, is taking its act out of the clubs and into the Ventura Court Theater in Studio City. Sound Magazine producer and guitarist Howard Pattow says the band is more like the Partridge Family TV Show than ever before. Not only are the band members playing the music of the show, but Pattow says they now perform "in character...with the aid of makeup and wigs." Sounds bizarre. And who plays Reuben Kincaid? Sound Magazine is the Partridge Family at 8 and 10:30PM, Friday at Ventura Court Theater, 12417 Ventura Court, Studio City. A couple of months ago I was invited to FM Station to check out a Partridge Family tribute band called Sound Magazine (an old PF album title). Since I was a big fan, I figured what the heck. At the time, I left the gig feeling cheated, thinking this was some gimmicky five-piece lipsynching to the recorded tracks. It wasn't until recently I found out that it was live (except for orchestration) and that singer Brian Yaskulka had mastered David Cassidy's voice. I'm impressed, as I think you will be as well. The group re-creates the TV family's songs and its '70s look when playing weekly at FM Station. Howard Pattow called Danny Bonaduce's radio talk show in Chicago to tell him about his band, Sound Magazine, which performs its all-Partridge Family repertoire every Wednesday at FM Station in North Hollywood, "You have a Partridge Family tribute band?" asked Bonaduce, the former child star who became famous on the 1970's sitcom. "Why?" Outside of a certain novelty element, why dredge up 20-year-old music that was not terribly impressive when it was new? "It's hard to listen to the Partridge Family and not smile," Pattow says Yeah, right. Laugh is more like it. Pattow disagrees. He says he and others of his generation have a special feeling for the sitcom and the music. "These were some of the first songs we learned as kids that really turned us on," Pattow says. "Even as we got older, we still had this soft spot for this music. The quality of the music was really high. OK, he does have a point, although a minor one. Because teen heartthrob David Cassidy was the only musician among the actors portraying the band who was featured in the recordings, the music on the band's albums was performed by top-notch Los Angeles session players such as Jim Gordon, Larry Knechtel and Hal Blaine. But although the playing on the albums was tops, the material never rose above the level of sappy musical pap. "It's something we all watched as kids," Pattow says. "There's a bit of kitsch, nostalgia and camp." Pattow says he got the idea for the band in 1993 around the time the Partridge Family reruns began airing on the Nickelodeon cable channel and some of the band's music was re- released on CD. Pattow says he realized that people had never heard this music live. "It was a labor of love," Pattow says. "We had the costumes made, we decided to make it a show and re-create these songs perfectly." To do that, Pattow and bandmate Brian Yaskulka painstakingly worked out the arrangements and recorded a digital audio tape backing track that includes horns, strings, flutes, congas and even the background vocals to augment the "live" performance. "Part of the show is an illusion, but most of it is live," Pattow says. "We're trying to re-create the songs, but also, we're trying to re-create the Partridge Family look." After listening to their tape, I must admit they really sound like the Partridge Family. The lead vocals by Yaskulka especially, have that unmistakable David Cassidy quality to them. With so many people saying that "the scene is dead," it should come as no surprise that so many bands, promoters, record companies and club-goers have chosen to resuscitate the past. You can hear the echo of late Seventies punk-pop, new wave and power pop ringing through the clubs as of late, but for the past couple of years, the flavor of choice has been early-mid Seventies pop and (ahem) disco. Yes, the Ghost of Music Past has reared its polyester head and is shaking its bootie on the dance floors of Los Angeles via bands like Boogie Knights (supposedly comprised of members of an Eighties Sunset Strip hair band), who have become so big that they've spawned offshoots like Disco Inferno and Bootie Quake. And now, the musical time machine has gone back a few years to the early Seventies, and hot on the heels of the Brady Bunch resurrection, it looks like the Partridge Family is experiencing a huge popularity comeback. Pictures of Keith Partridge adorn flyers for Seventies clubs and stare back at you from the covers of local underground fanzines. The Number One smash single "I Think I Love You" blares out of club P.A. 's, patrons sing along to "I Woke Up In Love This Morning" and wear pins with the face of former teen idol David Cassidy. There's even a Partridge Family tribute band called Sound Magazine, who plays every Wednesday at 9 p.m. at FM Station, opening for the aforementioned Boogie Knights and/or one of their incarnations. Get there early-it's packed by 10:00. Call FM Station at 818-769-2220 for details. It's been happening in New York City, too, where the Razor & Tie record label has reissued five CDs by the band their catalog calls "America's first family of pop" - The Partridge Family Album, Up To Date, Sound Magazine, Shopping Bag and the highly sought after A Partridge Family Christmas Card. Razor & Tie works hand-in-hand with the Seventies Preservation Society, an organization dedicated to Seventies disco and pop music (you'll see their ads in the Partridge Family CDs and their logo on the free pins they hand out at local clubs). All five albums include new liner notes, rare photos and a remarkably high level of sound quality. Check out the Razor & Tie catalog for more information. Contact them by e-mail at info@razorandtie.com or by snail mail at 214 Sullivan St. Suite 4A, New York, NY 10012. You can also call them at 212-473-9173.